This Hebrew tattoo basically spells out: "Skeleton from Isdael", but without the spaces. Did he mean "Skeleton from Israel"? That could somewhat explain why the Hebrew language was used. However, just by looking at his arm you can see this guy is no skeleton! Ideas, anyone? 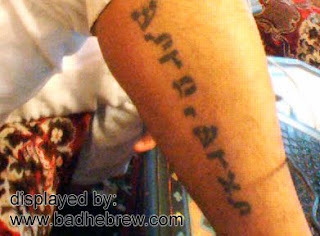 I would love to know just what this mangled Hebrew tattoo is all about. It should have been "שלום ישראל" I guess. My guess would have been שלך מישראל - yours, from Israel. Though Shmulik's proposal is more probable. What, no one else ever heard the hebrew verb: 'shel-duh-meesh-da-el'? It means "to pay to have oneself incomprehensibly tattooed yet not regret it." Ok, it's not in Aleph Melim, still.. Seriously, this odd-ink can also be read as (vowel-less) Russian. (my first reaction, head tilted to the right) Something about a Volga Vega'khyl. I assume that's a boatman, but don't quote me. Tilted to right... No, still "shalom msrael". Where did you see Russian? The most likely explanation is that the Hebrew is supposed to say "shalom me'israel" (hello from Israel), but the Vav of shalom turned into a Dalet, and the Resh of Israel became a Dalet. Those Hebrew letters are slightly similar - at least if you don't know the Hebrew Alphabet very well. Maybe he meant "shel dam yisrael?" Of the blood of Israel (whatever that means)? Not that "shel dam yisrael" makes any grammatical sense either :). I think that's his leg (calf area)... he looks to be sitting down, leg bent, with knee-length shorts, or possibly just hiked his pants up for the photo, but that definitely looks like a leg to me. I don't know that it is Hebrew. It looks a bit like Amharic. maybe it refers to the valley of dry bones, you know, from the book of Ezekiel?